While a closet is an enclosed space for storage, particularly for clothes, there are a number of closet types out there that serve different storage purposes around the house. And we know all too well how important it is to utilize storage space correctly! Having ample storage space and making the most of available storage not only helps you declutter, but also adds aesthetic value to your home. So without much ado, check out this detailed guide on the different types of closets with tips to store your belongings right! A walk-in closet is the top tier choice for storing clothes, shoes, and accessories. As this type of closet is an entire room on its own, it is not for nothing considered to be the dream closet for many. Walk-in closets aren’t meant to just store your belongings, but to showcase them! Often found in master bedroom suites, walk-in closets can cover a few square feet of area or can be as large as bedrooms, with windows or HVAC vents to maintain a comfortable temperature. Since they offer greater depth and storage space, these closets are hugely versatile and can be customized to suit individual tastes and storage needs. Design options are infinite, and you can have plenty of wall space to hang clothes, build open shelving units, or feature an island unit with drawers. Despite being huge on space, walk-in closets still need to be designed well to optimize storage capacity and to make for easy organization. Tips: Make sure you utilize corners and angles correctly, and are able to reach drawers and cabinets easily. Consider setting up different zones in your walk-in closet for efficient storage- for example, separate clothes by type, color, or seasons. Dedicate some wall space for displaying your shoes and handbags, or affix mirrors, install spotlights, and create your personal runway! Reach-in closets are the most common types of closets, but they are considerably smaller in size than walk-in ones. These were originally designed to hang clothes from a rod, with a shelf above. They also had return walls that provided limited access. Today, these closets are typically an arm’s length deep and can be anywhere between 3 to 8 feet wide, with partitions, hinged doors, sliding or bi-fold doors, or pull-aside curtains. While this sounds like a lot less storage space, reach-in closets combine variations of storage options and clever positioning to maximize space and help with organization. These functional closets usually have a long horizontal bar for hanging clothes, with shelves and drawers above and on the side(s) for additional storage. Tips: Space can be maximized by the use of multi-hangers and cubbies. For tall closets, place storage bins or baskets in the bar section on the closet floor. Use drawer inserts to keep socks, underwear, and lingerie organized. Hanging door organizers can keep your accessories and shoes in place while also making your closet space look pretty. This is essentially a reach-in closet that is used to store bedding, blankets, pillows, bathroom supplies, sheets, towels, etc. 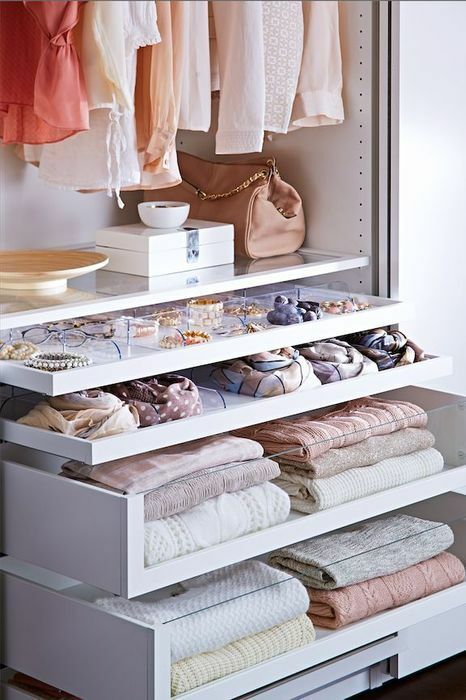 Unlike regular reach-in closets, linen closets only have shelves and drawers to stack extra linens and supplies. They can be doorless for easy access, or have hinged or bi-fold doors. Usually, linen closets are narrow and placed such that it’s convenient for everyone in the household to gain access to stored items, for example, between bathrooms and bedrooms or in the laundry room. A linen closet might also be built into a corner of the bathroom, or be a free-standing unit. Some linen closets are wide enough to house washers and dryers! Tips: Less storage space doesn’t mean your linen closet has to be a heaping mess of towels, sheets, and pillows. Avoid piling stuff too high; use high-sided bins, deep baskets, under-shelf baskets, and pull-out drawers to maintain order. Another type of reach-in closet, the hall or entry closet, as the name suggests, is placed near the main entrance of the house. A hall closet might be in the form of a small walk-in closet too, depending on the area it covers. These closets are meant to hold outerwear items like jackets, coats, overcoats, hats, shoes, etc. They also serve to hold sports gear, weather wear, umbrellas, brooms or snow shovels, and more. And of course, guest outerwear! Tips: Low cabinets or under-bench storage can help keep shoes and sports gear organized. Place a coat rack or install wall hooks to hang outerwear like coats and hats, and use an umbrella stand. Cabinets and shelves can serve to hold bulky off-season clothes like woollens, luggage, and other necessities. Pantry or kitchen closets are either near or inside the kitchen and can be reach-in or walk-in types. Reach-in pantry closets generally have sliding or hinged doors, while walk-in ones might be partitioned or doorless. It’s also common for pantry closets to have slatted doors or shutters. Pantry closets have taller cabinets than normal base cabinets. They come equipped with a varying number of shelves and internal drawers to accommodate everything from spices and condiments to dried and canned foods. Shelves and drawers can also be used to store additional cutlery, serving dishes, bakeware, cleaning supplies like dishwashing liquid and towels, and packaging supplies like clear wrap and aluminum foil. Some kitchen closets can host mops, brooms, and closed garbage pails too. Tips: To make the most of available space, employ lazy Susans or corner baskets. This will also make it easier to reach things stored at the back easily. Also, store daily use items at eye-level. Installing hooks and bars on the inside of cabinet doors can maximize storage space! Usually a reach-in closet, a utility closet is meant to store anything other than clothes, linens, and food items. 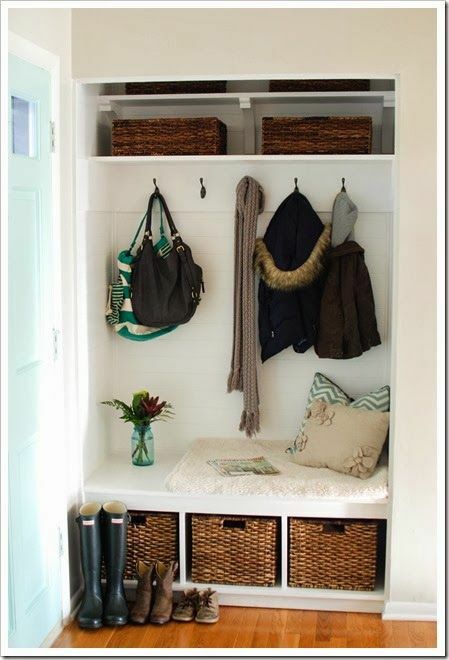 A utility closet can be inside or near the garage, or in the mudroom or basement. It houses all those little things that you don’t need on a daily basis, but are important for keeping your household functioning effectively! As such, your utility closet could house cleaning chemicals and supplies, pesticides, gardening equipment, hammers, screwdrivers, hardware and tools of all sorts, paint cans and brushes, mops and brooms, vacuum cleaner, party and craft supplies, and so on. Tips: Just like any other closet space, ensure items are stored such that they are all clearly visible. Using shelving, wire baskets, and hooks can help keep items organized. Group like items together in bins or boxes and label them appropriately so you can tell what’s inside without having to rummage through the contents. Keep a stool or step-ladder nearby to reach overhead space easily. An armoire is any tall, free-standing cupboard, falling under the general category of wardrobes. Dresser is short for dressing table, and is also referred to as a vanity or lowboy. It is a low table with horizontal drawers, and has an attached mirror. A chest of drawers, also referred to as tallboy or highboy, has 4-6 drawers stacked one above the other. While many people use the terms ‘wardrobe’ and ‘closet’ interchangeably, the two are very different from each other. You already know what a closet is- a fixed and dedicated space to store things. By contrast, wardrobes can be purchased from furniture stores or can be custom built to your requirements. As such, wardrobes are available in a range of shapes and sizes and can suit multiple purposes. 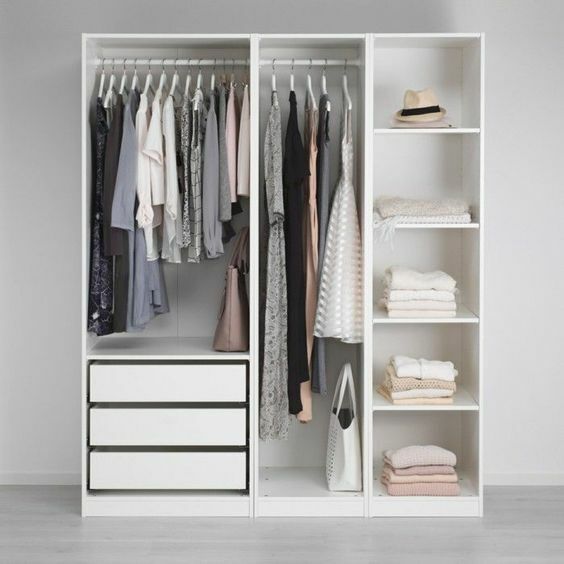 A great advantage of wardrobes is their portability factor as you can shift them around the house or room depending on your needs or foot traffic. Most importantly, a wardrobe is extremely beneficial to people who don’t have any or ample closet space. Tips: Expand storage space by making use of drawer inserts and dividers, under-shelf baskets, and hangers. A great idea is to affix rods depth-wise on both the sides of the wardrobe (outside or inside) to create additional storage space. Clutter around the house can make you feel out of control. It also makes housework difficult and adds undue stress to your life. With so many storage options available to you, you don’t have to put up with clutter any more! Identify the best storage options for your home, maximize storage space wherever possible, and give your home a clutter-free look. We’re sure you found the information provided here helpful. Happy organizing!